On June 5th, 2018, I placed a brand new welcome mat in a grassy hollow just off the sidewalk along Wisconsin Avenue in downtown Milwaukee. 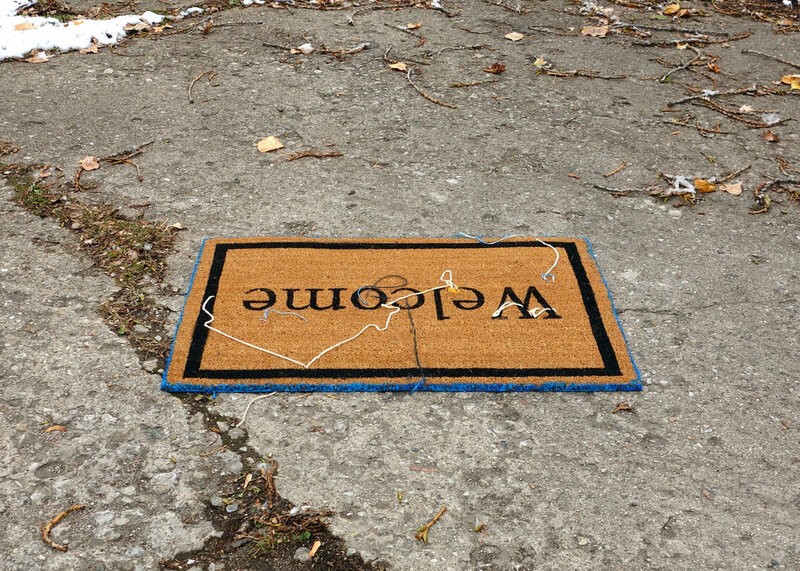 I had purchased the welcome mat for $20 for the purpose of leaving it in a public space where its presence would not be expected, which is really anyplace that is not a doorway or physical entrance. The welcome mat was my contribution to an exhibition commemorating the 15th anniversary of The Mary L. Nohl Individual Artist Fellowship. The exhibition took place at the Haggerty Art Museum on the campus of Marquette University. The welcome mat was situated far from the museum, playing up its ambiguous purpose by disassociating it from routine, or artistic, function. Instead, I purposefully placed the welcome mat in the middle of a fire hydrant, sewer cover, and utility cap in order to associate it with these visible reminders of elaborate, largely-hidden infrastructures that society collectively invests in and relies on. A welcome mat, in its normal context, is practical and useful, but its message is largely overlooked if not irrelevant. On the other hand, when out of context, extending a welcome becomes politically charged and the welcome mat’s message overshadows its function. It is no coincidence that I began working with welcome mats in late 2016 as national and international discussions regarding who belongs, and who does not, grew increasingly divisive. That said, my interests have always gone beyond political talking points; the act of publicly offering hospitality becomes equal parts poetic, provocative, comedic, and civic. I didn’t expect the mat to garner much attention, but it didn’t take long for me to be proven wrong. Over the next four months, cutting to the punchline, the demand for my artwork spiked to unprecedented heights and I maneuvered to keep a few steps ahead of having the joke be on me. Welcome. Home. uses an artistic strategy that shifts the site of where something is encountered in order to alter its meaning or potential impact. Staging or seeing an opera performance in someone’s living room is a recent example while Duchamp’s “Readymades” have been a point of reference for art students for over one-hundred years. A welcome mat is well-suited for such displacement because the politics of hospitality are disproportionately complex compared to the simple optimism of its one-word greeting. In April 2018, I was invited to be an Artist-In-Residence at The Luminary in St. Louis*. While there I focused on the welcome mat as prop and portal. I visited neighborhoods throughout the city, installing welcome mats in order to gauge my own and other’s response. Sometimes I would leave the mat in place and other times I would bring it with me to another site. After weeks of research, I made the following journal note: “removed from the doorway, a welcome mat warps the space around it by inviting one to imagine a physical threshold where none exists. The invitation to enter becomes purely psychological.” At the time, I did not know this would foreshadow the project’s evolving focus on visible versus hidden information and the subsequent effect on an item’s value. 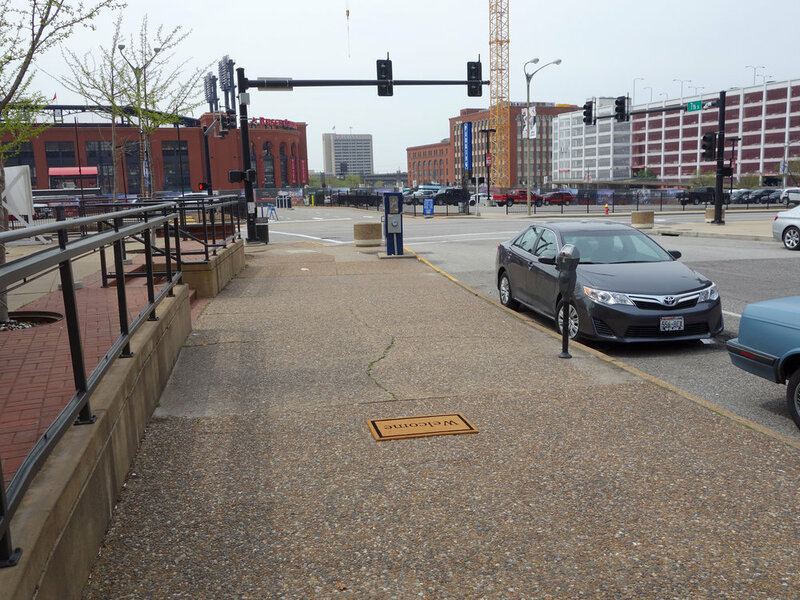 The first welcome mat was removed by unknown person or persons a week after it was installed. A second mat was installed on June 21st. It also went missing in less than two weeks. Working with the Haggerty Museum, we were prepared to have the mats disappear, but surprised by how quickly it was happening. At the outset, I was content to think about missing welcome mats carrying their message of tolerance, like Trojan Horses, onto random porches. But whoever took the second mat seemed to intentionally leave the site in shambles, which got me thinking about the welcome mat as site of exchange. It occurred to me that the project needed a feedback loop, or the potential for such. Starting with the 3rd mat, I began to inscribe the underside with addition information using permanent silver and gold markers. 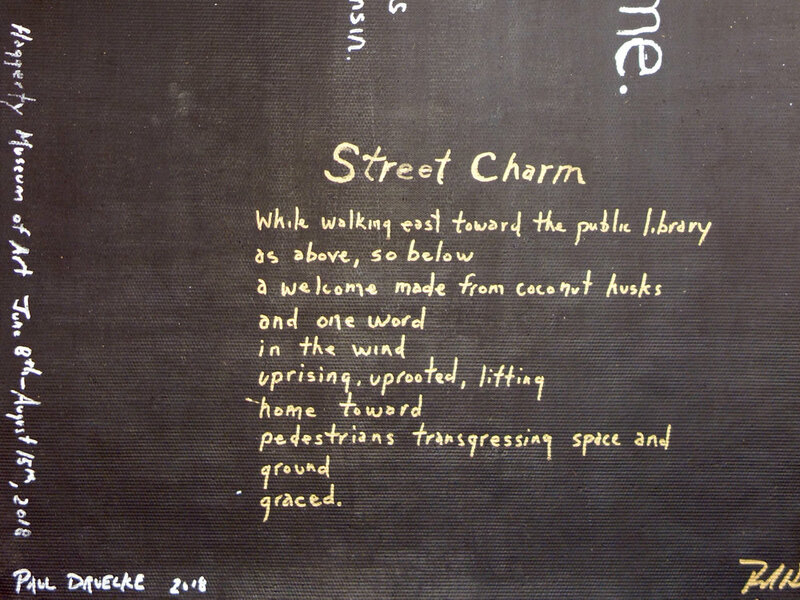 In addition to title, date, and author, I offered a reward for the mat’s return and included a poem written for that mat and location. The inscribed welcome mat dramatically shifted how the object’s potential value could be read as functional, poetic, collectible, ransom or any combination thereof. I wasn’t sure where, or how, I wanted questions of value to resolve, but it seemed my artistic ego was on the line. The third mat was installed on July 16th and goes missing within a week. The pattern was becoming shockingly consistent, but the third mat carries a fundamentally different dynamics in that there is no expiration date for its return of the mat or the reward. The fourth mat was personalized with the same information, designated as #2 in the edition, and installed in the same location. Once again, the fourth mat was taken within days, and my aforementioned punchline bears revisiting. 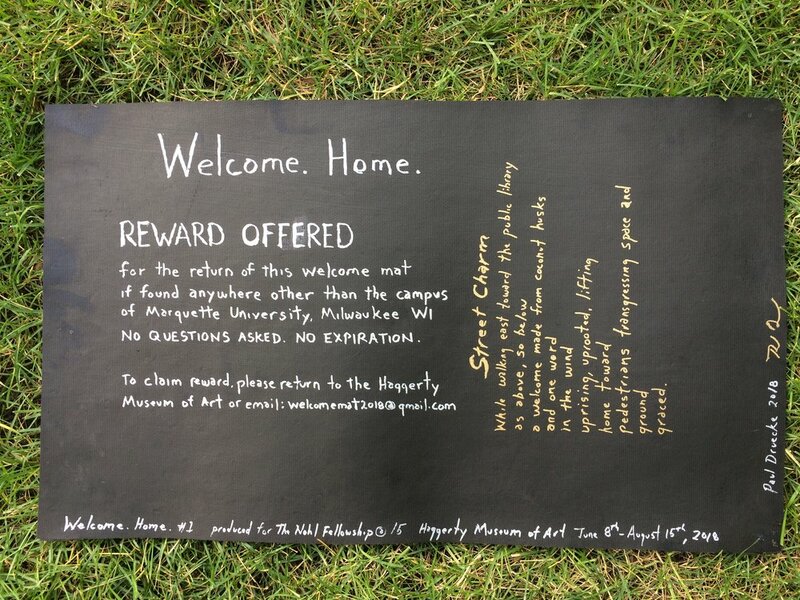 On August 20th, the fourth mat was anonymously returned to the front door of the Haggerty Museum. No one has, to date, contacted the museum or emailed us to request their reward. A few weeks later, in Mid-September, I re-installed the fourth mat and, once again, it was gone in less than a week. At this point the tally is: four welcome mats, or five depending on how one counts the returned mat, whisked away in less than seven or eight weeks of being on view, so to speak. It seemed a good point to interrupt the cycle, not least because the exhibition’s outdoor component was officially over. I took the experiences of the summer into my studio. I began further altering the mats to skew the ration of function and form. I began sewing into the mats to create a path between visible and hidden. 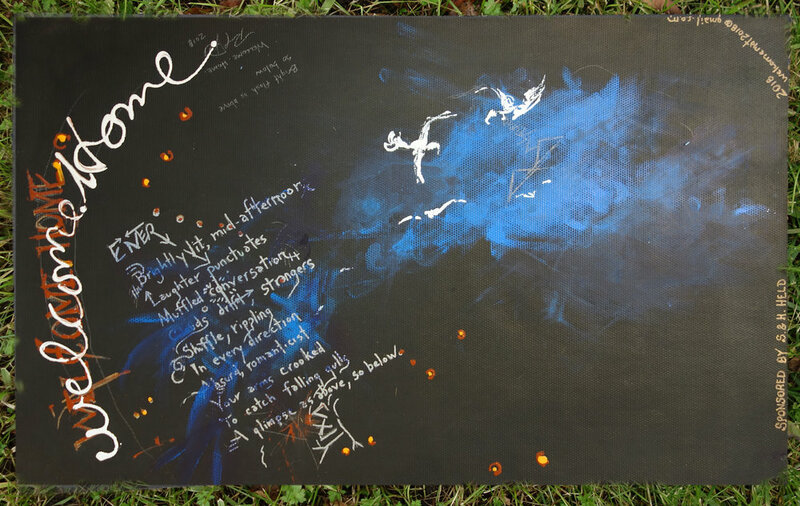 I started further experimenting with the inscription’s imagery. Finally, I began to think of each welcome mat as a page in a book of poems and spend a portion of each day writing verse for the underside of welcome mats. In a recent development, I have begun soliciting sponsors who can buy naming rights for a limited edition of Welcome. Home. to further complicate their value. The price is right and benefactors get a mat for their personal use or collection. Hit me up. * Funding for the residency provided by The Luminary and The Mary L. Nohl Suitcase Export Fund. ChefD contemplates the changing seasons when he hears a knock on the door. A Milwaukee Kitchen Special Episode with food scholar, Scott Barton, and artist, Portia Cobb. Watch for Scott’s excellent recipe for the perfect celebratory beverage. Thanks to Portia and Scott for making time during a very busy weekend of shopping, chopping, cooking, tasting, and perfecting while preparing a harvest meal for 40 community members as part of their collaborative project, Lizzie’s Garden: The Storied Land – The Storied Plate, Thanks to Polly Morris @Lynden Sculpture Garden for always making the connections. We are grateful for the help of neighbors including all-around problem solver, Melissa Scherrer Páre. 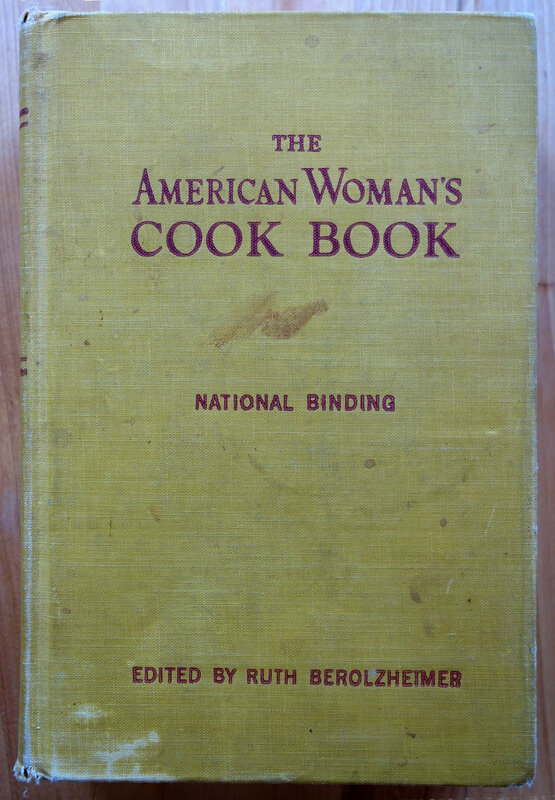 We're looking at a couple of our favorite cookbooks today. ChefD is juggling a lot as always: guests, nature, poetry, improvisation, and more cookbooks in the heart of Riverwest. With guests: @TyannaBuie, @ChuckStebelton, @JeanneHammes, @ArianaVaeth, @FloraCoker. Join ChefD for an afternoon in Milwaukee Kitchen. The kitchen is busy, guests show up unannounced, nature, poetry, cookbooks, and cookery set to a Riverwest score. With guests @EmirÇakaroz, @DomincFendt, @ShizukiIde, @CeceliaCondit, @IsabelBeeman, and @FloraCoker. Caraway. Curry, Shakers, Ronald Johnson, Ms yeah, incoherence, magic, it's a busy day @MilwaukeeKitchen. Featuring @ChefD, @Renato Umali, @Anika Wilson, @Laj Waghray, @Flora Coker, @Sarah Buccheri. Join Chef Didier for an afternoon in the Milwaukee Kitchen. Follow him as he explores the traditions and trends of cookery while serving up Midwestern domestic hospitality. Special thanks to our guests: Matthew Lackie, Flora Coker, and Rachel Stenman. Paul Druecke included in the stellar roster of artists participating in Front International.